The eerie predictability of nerd questions – jimnosredna: jim anderson backwards, sort of. A hallmark of complex concepts desperately in need of intuitive explanations is that when you search on “intuitive explanation”, Google accurately predicts exactly what it is you need an intuitive explanation of. This I found to my pleasant (and slightly eerie) surprise when my son asked a question* and I searched for an intuitive explanation of “principal components”, a mathematical/statistical/analytical technique for efficiently describing data. I didn’t even need to type the words. 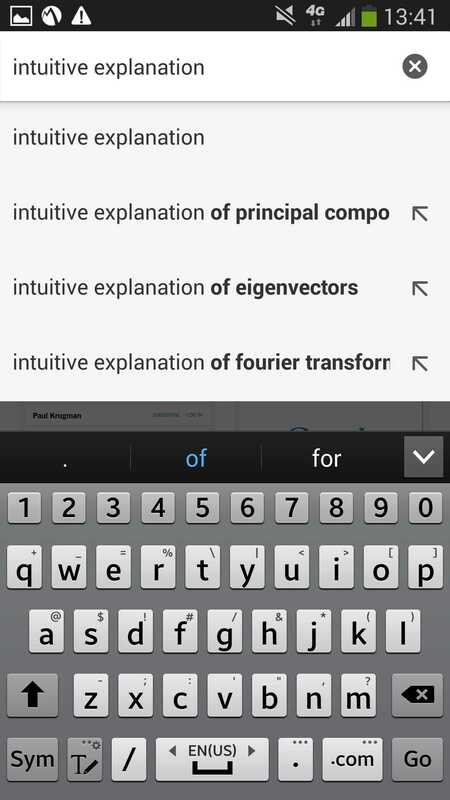 “Principal components” was right there, eerily and accurately predicted by the search engine. Aren’t there more complex concepts in need of intuitive explanations? Relativity, perhaps? The Electoral College? Fiscal policy in the Euro zone? The meaning of “intuition”? Apparently not. It seems principal components is tops when it comes to nonintuitive ideas needing intuitive explanations. In case you are wondering, here is a link to the number one intuitive explanation. It is pretty intuitive, at least until the author gets into “eigenvalue decompositions”. Here is another intuitive explanation I like. It involves beer.